I don’t know about you all, but sometimes I just need an afternoon snack to tide me over, fill me up and give me energy to finish out my workday. These Greek Snack Flats are that perfect snack with 7 grams of protein, 4 grams of fiber and everything you need to keep you full and motivated until dinner. Plus, they’re obviously delicious. 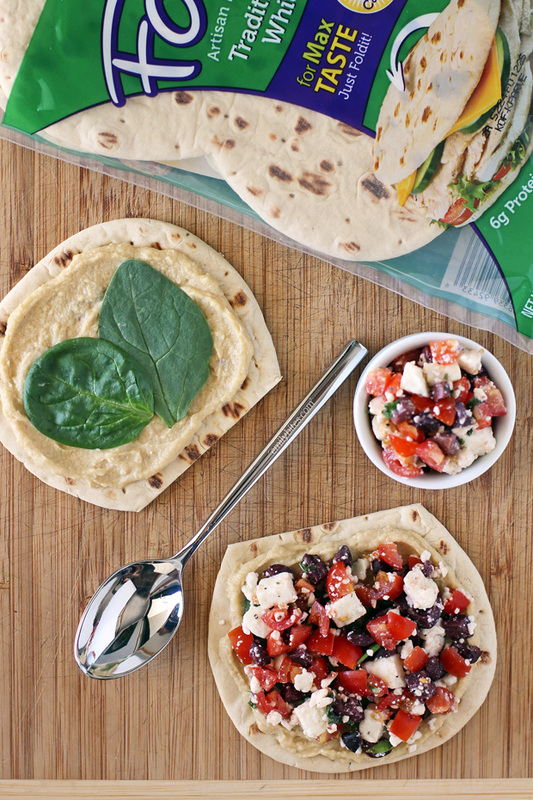 Tasty flatbread with a rich layer of hummus piled high with tomatoes, feta, olives and basil – what’s not to love? One of the best things about these Greek Snack Flats is that they’re an easy snack to make at work since they don’t require any cooking. You can even mix up the tomatoes, olives, basil and Feta at home and bring it in a sealed container so that building a flat when your hunger strikes is a breeze! 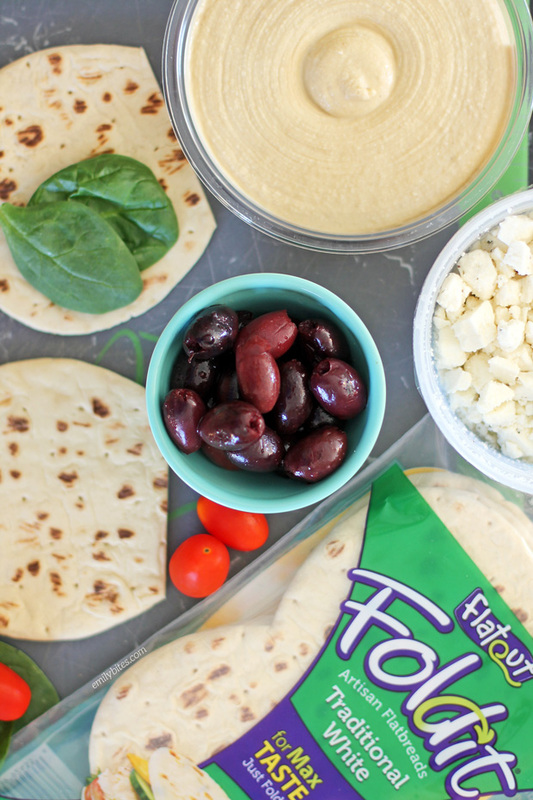 As many of you know, I love me some Flatout* flatbreads and I’ve been working with them to make lots of delicious recipes throughout the year, both here and on their blog. Mostly I’ve done lunch or dinner recipes, so I thought it was a good time to change it up and make an afternoon snack – they’re not just for kids anymore! The thing about these Foldits (and any of the Flatout products, really) is that they’re the perfect blank canvas to be creative. You can make pizzas, wraps, sandwiches, pinwheels, and the possibilities for flavor combinations are endless. We keep Flatouts on hand at all times because it’s so easy to use them to throw together a quick and easy meal or snack with anything you have on hand. 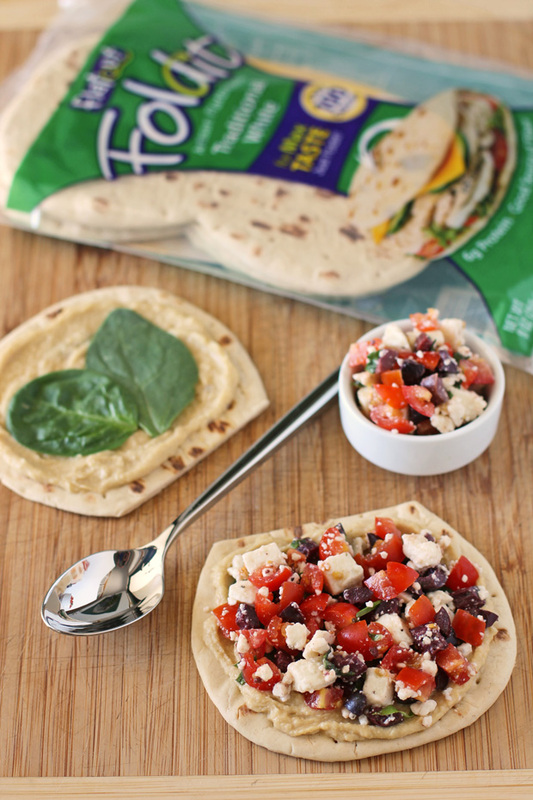 Looking for more ways to use Flatout flatbreads? Check out my Bacon Cheeseburger Wraps, Spinach Artichoke Flatbreads, Chicken Pesto Flatbreads, Chinese Chicken Wraps, Chicken Pesto Wraps and Mexi-Burgers with Guacamole as well as recipes I developed for Flatout’s blog including Baked Chicken Parmesan Sandwiches, Sloppy Joe Flatbread Pizzas and Hawaiian Ham and Cheese Melts. Using shears or a sharp knife, slice the foldit flatbread in half at the seam so you have two rounds*. Spread a tablespoon of hummus onto each half and place two spinach leaves on top of each flat. In a small dish**, mix together the tomatoes, olives, Feta and basil leaves and then spoon evenly over each flat. Being gluten-free, I choose to use corn tortillas, toasted in the toaster, and then I pile on the above ingredients. Also with more than 20 years exposed to Armenian cuisine, lavash bread would work too as a base. Anything wrapped in a flat, or topped on a flat would be delicious! This is delicious! I just made myself one for a late lunch. It was wonderful, if a little messy. My tomatoes kept falling off. I used a small piece of romaine lettuce instead of the spinach leave, just because that was what I had on hand. I will definitely be making this again. When this popped up in my instagram feed, I HAD to make it! And so I did, and it is just as delicious as it looks! Perfect little snack! I loved these! I made 2 and had them with some extra Spinach on the side for a filling lunch! Does 4 per snack mean the portion is (4)?